Do you ever have one of those ideas that hits you when you are about to fall asleep and then forget to write it down and then wake up in the morning going "Dang, I know I had an awesome idea but what was it??" You know because your mind forgets?? 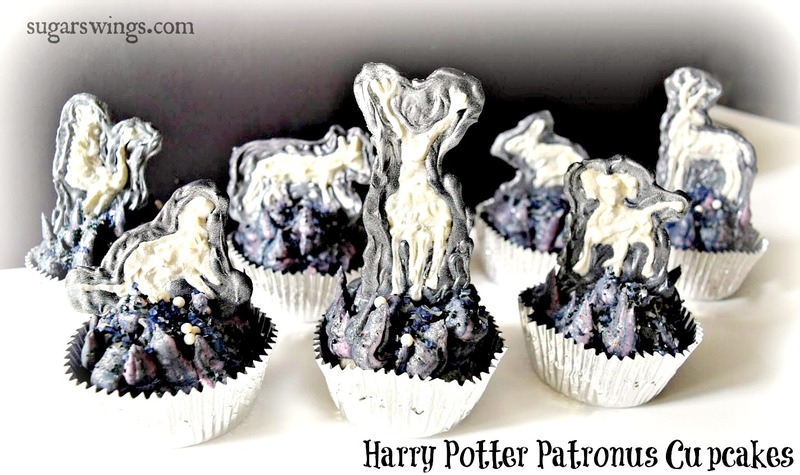 Well I do that All.The.Time but this time I managed to wake up a little to write it down - and hence you get Harry Potter patronus cupcakes! You guys probably know I am a huge HP fan. Every time one of the channels plays the movies all weekend I pretty much have to leave it on as a loop playing in the background. 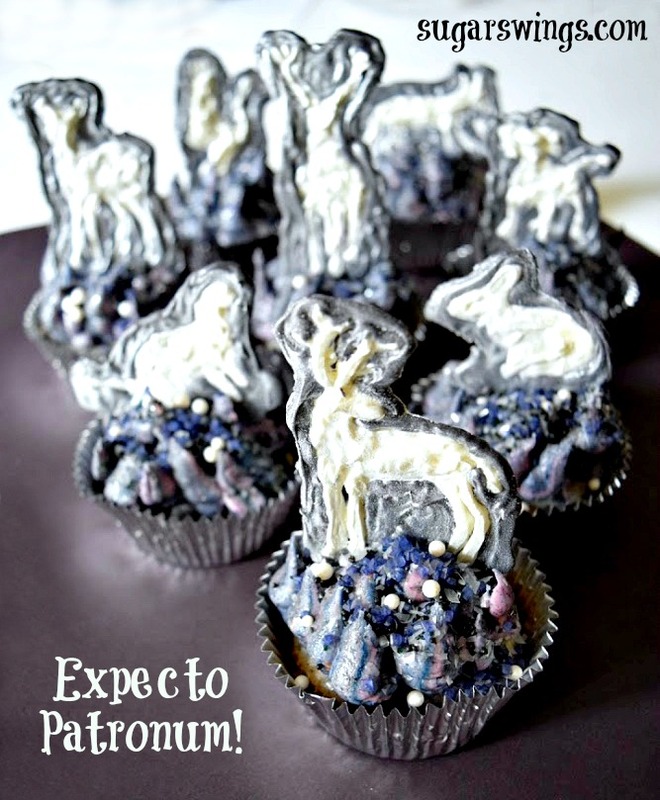 I love that all the wizards and witches have a patronus. A patronus is protection or guardian charm that takes the form of an animal that the caster has deep affinity. You can also find your own patronus on the Pottermore site. 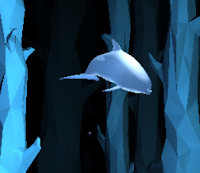 I love that mine is a dolphin! 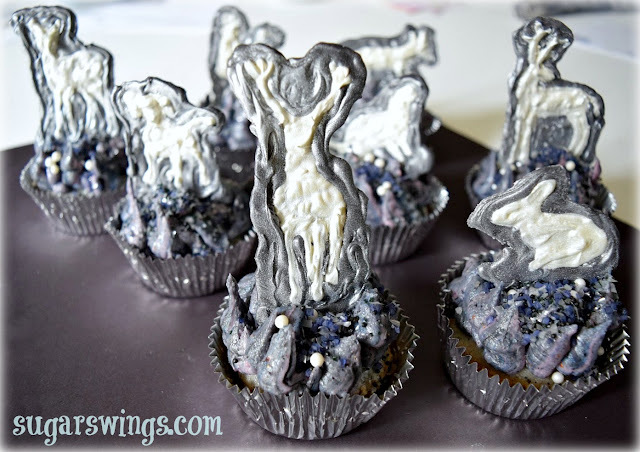 The patronus cupcake toppers start with vanilla candy melts/wafers. 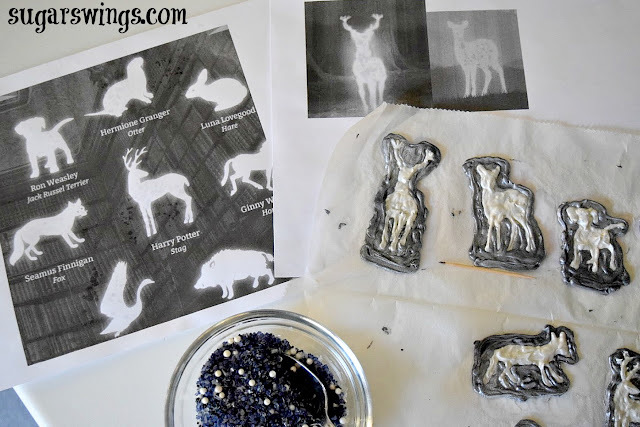 Once vanilla candy is dry, outline with black candy melts/wafers. Since a patronus is very ethereal and seem to glow I sprayed mine with Wilton pearl color mist. Color mist is kinda like edible spray paint. I made the animals for Harry and his friends but you can use your favorite animals too. The cupcakes and cream cheese frosting are flavored with freeze dried blueberries. 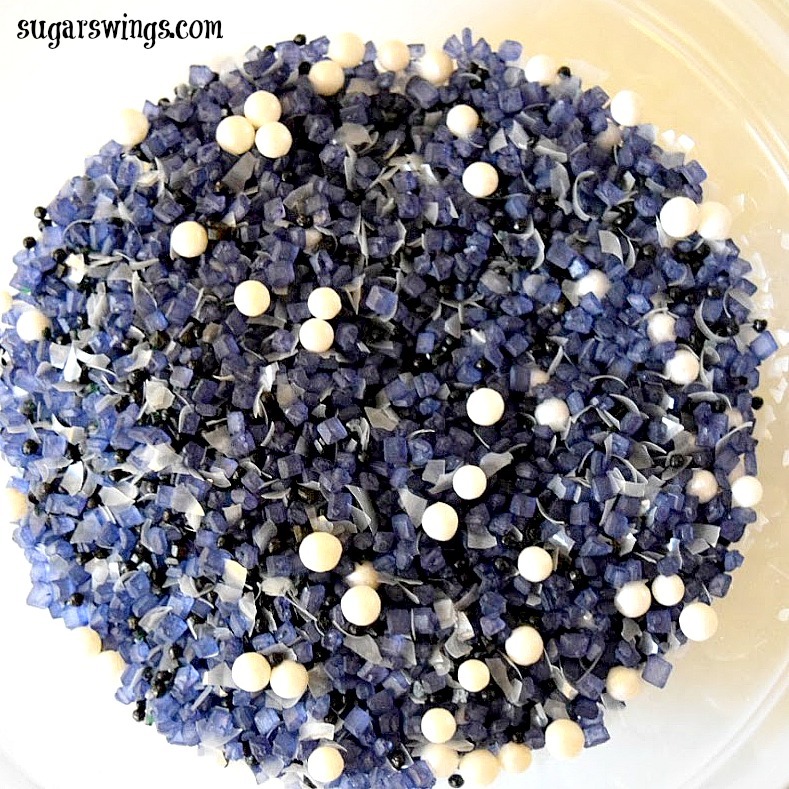 Also made my own sprinkle mix using a bunch of sprinkles I have in the cupboard. I am calling this mix "Expecto Patronum!" 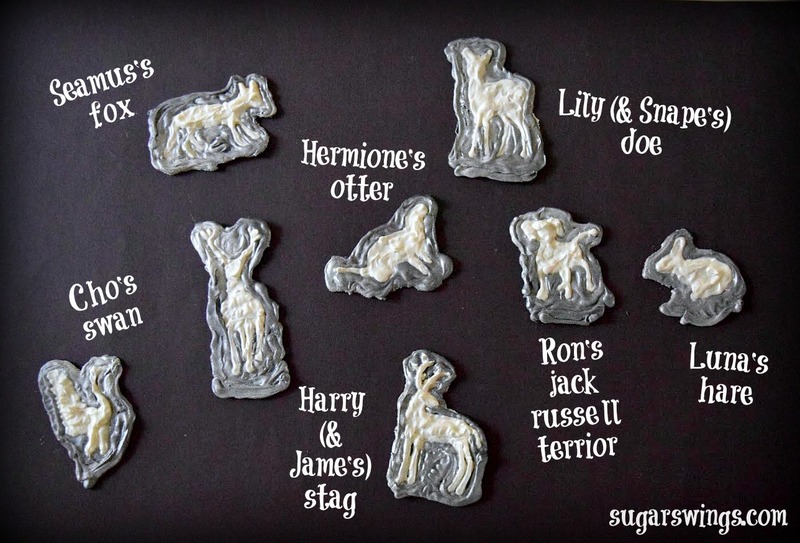 And in case you can't recognize the animals and don't know who has what patronus, you can see them below! 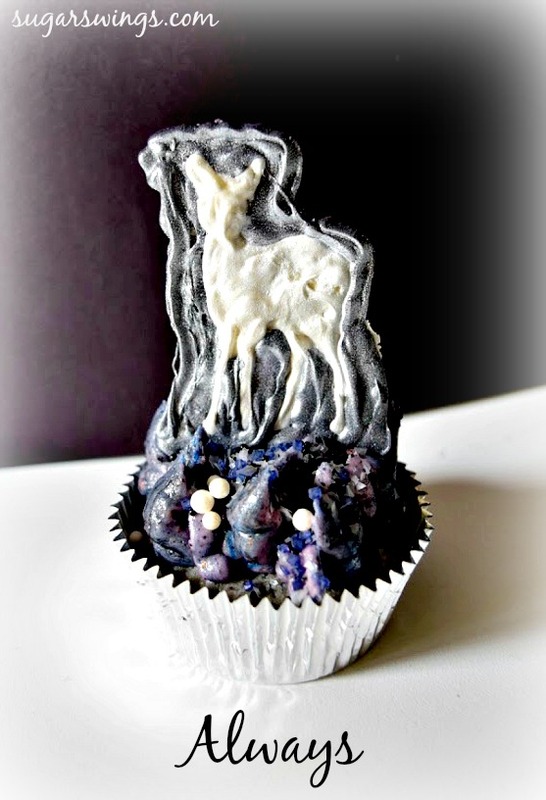 Although the hands down the winner is Snape and Lily's doe of course! To get ready for the next JK Rollings movie Fantastic Beasts and Where to Find Them (can't wait! please be good, please be good, please be good), the original HP movies are playing in IMAX theaters though October 20th! Go check Harry and the rest of Dumbledores army out in theaters again! 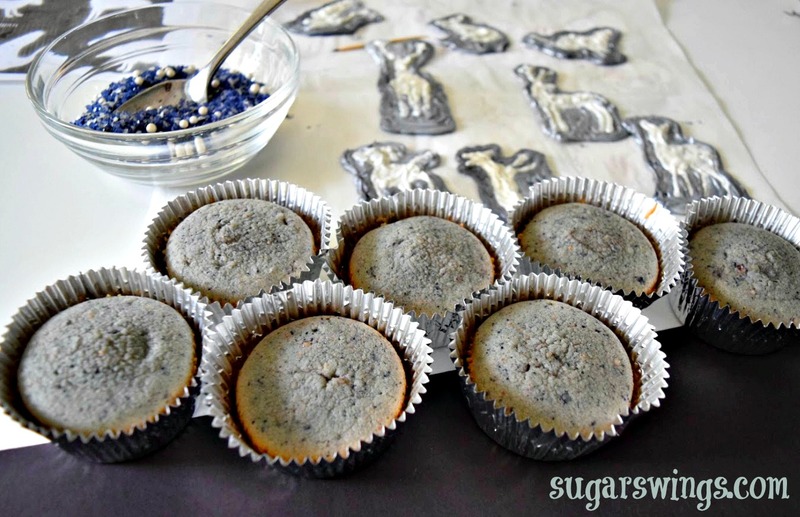 Prepare cupcakes as per box directions adding 1/2 cup of powdered blueberries into batter before baking. 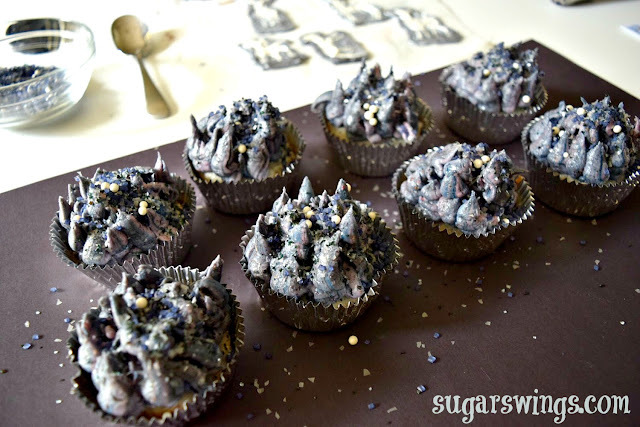 Mix 1/2 cup of blueberry powder into frosting. Tint with blue/black food gel if desired. Pipe cooled cupcakes with frosting and top with sprinkles. 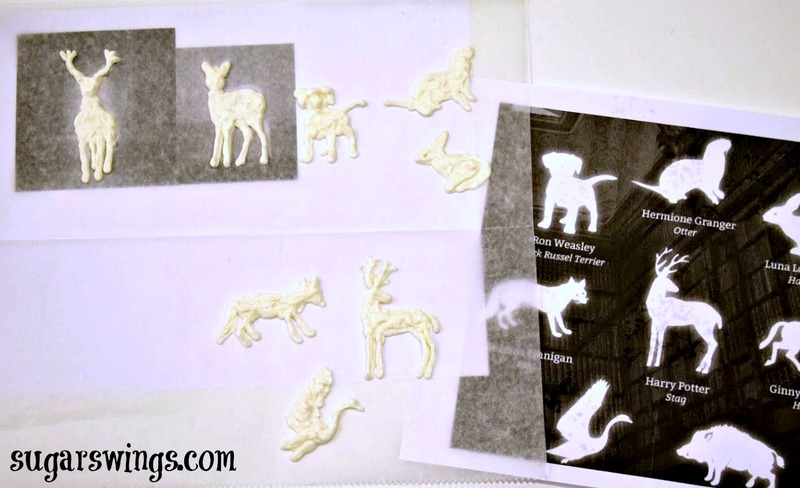 Print animals into 1 and 1/2 - 2 inch sizes. Cover will parchment paper. Melt each color of candy wafers in quart sized freezer bag in 15 second intervals in microwave until just melted just before using. 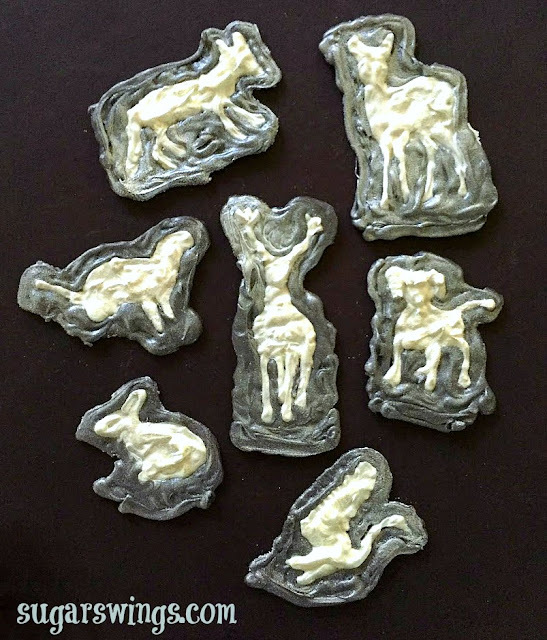 Snip an end of the bag with vanilla candy and trace the animals. Let harden 10 minutes. Spray animals with color mist. Let dry 10 minutes. Snip an end of the bag with black candy and outline animals. Let harden 10 minutes. Spray entire candy with color mist. Let dry 10 minutes. Stand up patronus candies in cupcake as toppers. These look so cool! I love the effect the color mist has. Thanks Alison! 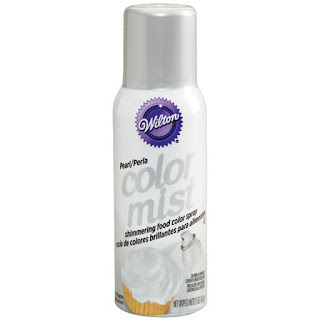 Love the color mist effects and I use it all the time. Thanks for taking time to comment! !